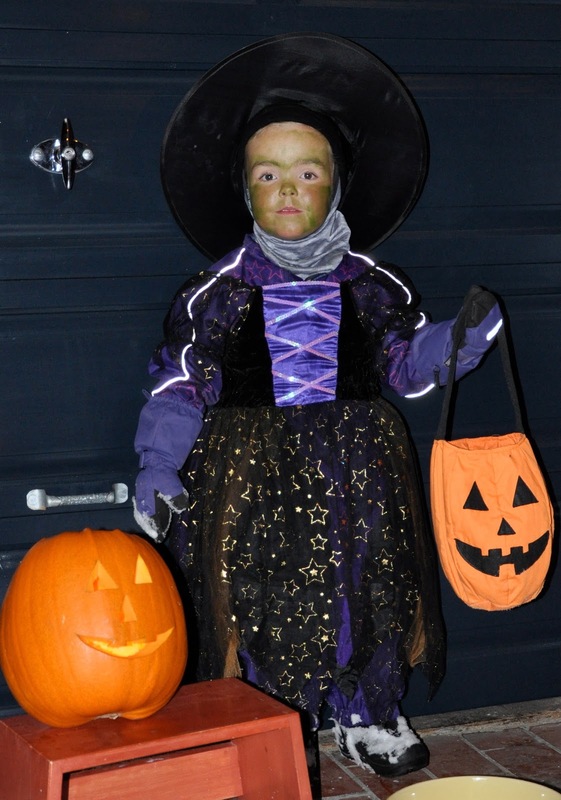 It's Halloween in Norway, and although I was in Oslo and missed out on the goings-on at home in Lillehammer, I got the report, with pictures to boot. Erik bought what may have been the last pumpkin in town on October 30th for about $25. 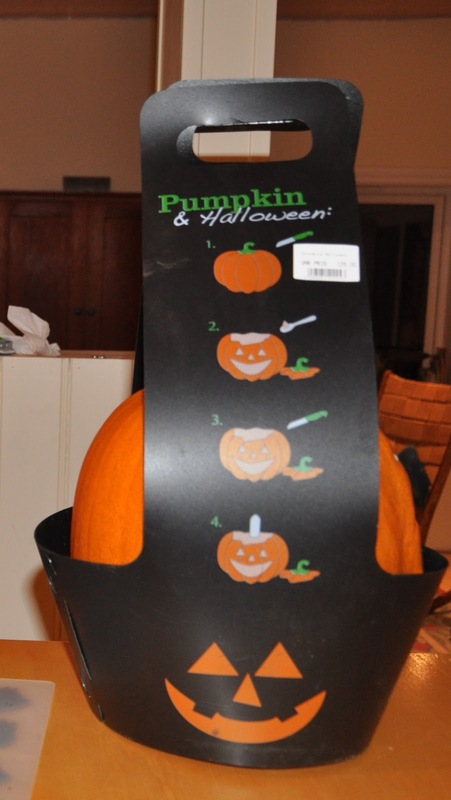 What is particularly amusing about the packaging of the pumpkin--aside from the fact that it actually comes with packaging--is that there are instructions on How To Carve a Pumpkin. Although I can't be so sure, it does sort of appear that #4 instructions the user to put a candle on the top of the pumpkin. . .
We were struck with an early arrival of winter in Lillehammer, and had nearly 10 inches of snow on the ground for Halloween. This did not seem to damper the spirits of our little witch (whose costume was bought at Joanne Fabrics in the US a few weeks ago for about $5). As I wrote last year, Norway embraces the "gory" side of Halloween--the ghouls, skeletons, blood, creepy stuff--and it seems to attract mainly elementary school age kids. Having a 3-year-old princess walking around the neighborhood last year collecting candy was a bit of an anomaly--both because she was 3 and because she was a princess. This year she decided to be a witch, which sounded good to us, being a little more in line with the local "customs". (As if respecting the local customs of a 100% imported American holiday is important. . .) Having a 4-year-old witch out trick or treating was strange enough. Erik stuffed Greta into a snowsuit, stretched the cheap-o witch dress over the snowsuit and pulled her hair back with a black buff and skull cap to fit under the witch's hat. Top it off with some purple mittens (which, along with the purple snowsuit, blended quite nicely with the purple witch's dress) and Greta was set for trick or treatin' Norwegian style. They headed to a slightly more American/British-ized neighborhood where we had success last year, and collected an amusing selection of goodies. Among those were loose, unwrapped pepperkaker cookies (traditional Norwegian Christmas cookies, now being sold in the stores), a candy cane, Christmas chocolates, and a package of single-serving hot chocolate mix! Greta looks so cute! Well done, Erik. Even though I know it's difficult to find individually-wrapped candy in the stores here (without spending a fortune), I am surprised that someone handed out unwrapped cookies. Either that someone is a little, erm, tacky, or he/she got caught off-guard by trick-or-treaters and had to scramble. Even so.... Glad Greta and Pappa had fun.